I have always loved old vintage ladders. I grew up on a farm and old ladders were everywhere. It's something about the imperfections, I think, that makes them so endearing. I've passed my love for old things on to my daughters. They are in the midst of an apartment makeover and here is a pic of a great vintage ladder redo they are using in their living room. Isn't it spectacular? I love the old cameras, books, typewriter, records and suitcase. It speaks to me. Kind of gives me a warm fuzzy feeling! Tell me what you think. I'd really like to hear from my viewers. Share your ideas with me. I love hearing what others are up to! I added this old ladder to my studio bathroom. I really like the versatility of this piece. I haven't added extra shelving yet to the bottom, but I might do that one day. Who knows. In the mean time, I love him just the way he is! So, there you have it. 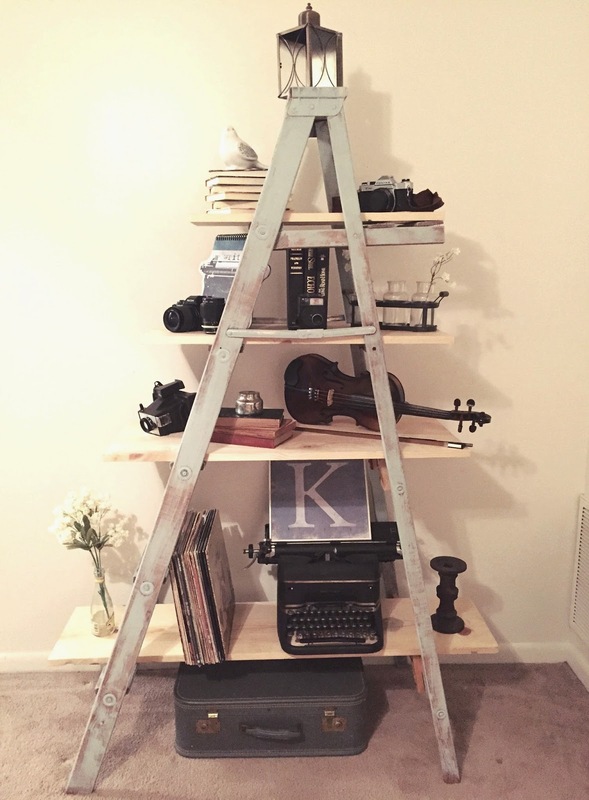 Two pics of really great uses for those old vintage ladders! Get out there and go thrifting. It's a great way to find these treasures!